“Mirror, mirror, on the wall, who’s the fairest one of all?” While her motive in asking the question was suspect, Snow White’s wicked queen might actually have been onto something. She was quite faithful in asking her mirror, every day, if it liked what it saw. And the mirror couldn’t lie. I believe that if singers looked, with such regularity, into a magic mirror that was bound to tell us the truth about what we actually look like when we sing, many of us would come face to face (literally) with some very valuable information. But since magic mirrors are hard to find these days, most of us can make do with a regular one. When he studies his Lesson at Home, let him sometimes sing before a Looking-glass, not to be enamoured (sic) with his own Person, but to avoid those convulsive Motions of the Body, or of the Face (for so I call the Grimaces of an affected Singer) which, when once they have took Footing, never leave him (Tosi 1923, p. 89). “Yes, of course!” I hear you agreeing. “I know singers should practice with a mirror sometimes. In fact, my teacher has a huge mirror in her studio.” The real question is, how do you use it? (Or, even, do you use it?) In my experience, while mirrors abound in voice studios and practice rooms, singers often avoid them or find it deeply challenging to look into them. Once, I even had a singer tell me it would ensure that she had a “bad day” if she looked in the mirror while singing! Given this widespread mirror-resistance, why should we challenge our discomfort? And encourage our students to do the same? The answers are both incredibly simple, and surprisingly easy to overlook. But just as important as watching for function—perhaps even more so—is expression. The face is an exquisite instrument of communication, but one which often gets far less scrutiny and training than the one that makes the sound. Have you learned how your face reacts to feelings of joy, anger, sadness, surprise? Have you gauged how these physical reactions may affect your vocal production? Do you have facial habit that might affect a viewer’s perception of your emotion while you sing? (For example, a furrowed brow can look like anger; a raised and wrinkled forehead can mimic surprise.) And when you feel that you are truly expressing your music, do your face and body reflect that internal engagement? To what degree? (For example, nuances of facial expression that would be quite effective up close or on camera, do not “read” in the same way across greater distances, e.g., from the stage to the back row of the house.) All these questions are quite difficult to answer without occasional use of a mirror. Despite these powerful rationales for using a mirror in practice, why is it so common for us not to? I suspect that our resistance often stems from the greater mental challenge posed by staring some of our technical issues in the face (again, literally). But that very dissonance, as uncomfortable as it may be, can become a powerful feedback tool that leads us to quicker improvement. After all, this ability to internally guide the voice, using the sounds and sensations that have become associated with balanced coordination, is the end goal of all technical work. Unless we are singing Marguerite in Faust, there will probably not be mirrors on stage with us! So here is today’s practice challenge. If you do not already use a mirror in your practice (or, more likely, if it’s been a while since you’ve done so), give it a try. Just for a few minutes! Use a compact mirror if necessary, or pick up an inexpensive small hand mirror from the drugstore. (These allow you, at least, to monitor your jaw, tongue, and embouchure.) Of course, a full-length mirror—which allows you to watch your whole body’s alignment—is even better, and can also be found inexpensively. In front of the mirror, sing a few exercises. Sing a few phrases from your repertoire. What do you like about what you see? What would you adjust? Do you know what to look for? If not, discuss the question with your teacher and discover what ideas emerge. 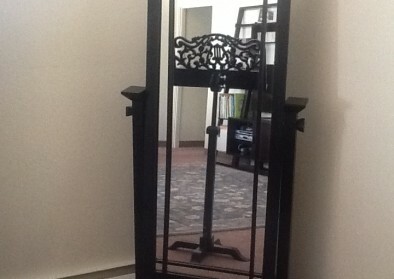 Please share your questions, views, or successes regarding singing with the mirror. Happy practicing! For an interesting perspective on mirrors from another artistic discipline, read “Reflections on the mirror: six teachers on when you should and shouldn’t look” which appeared in Dance Magazine, July 2007.